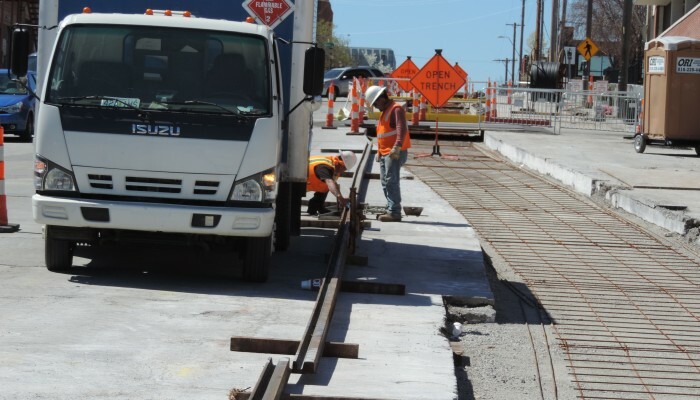 KC Streetcar crews will be working along the alignment on Saturday, April 4. Most work will be on 3rd Street as crews build track and pour concrete near Main St.
Main St at 3rd will be closed to thru traffic until Monday morning. Traffic can access Main St from Walnut and 2nd St.
3:30 a.m. rail pull to 3rd St in The City Market. There will be temporary closures of side streets and 3rd St as rail is placed on site. Anticipate being complete b 7:00 a.m.
Sidewalk work at the northwest corner of Independence & Delaware. Saw cutting on Main St between 7th-8th. Sidewalk restoration work around Overhead Contact System (OCS) pole foundations from Truman Rd South – 20th St.